The Spanish language always intrigued me and is a second unofficial language in California. I never studied the language in high school or college so in 1989 I joined an evening class at Foothill Junior College in Los Altos, CA. After completing two semesters, I dropped my studies until I began again in the fall of 2001. 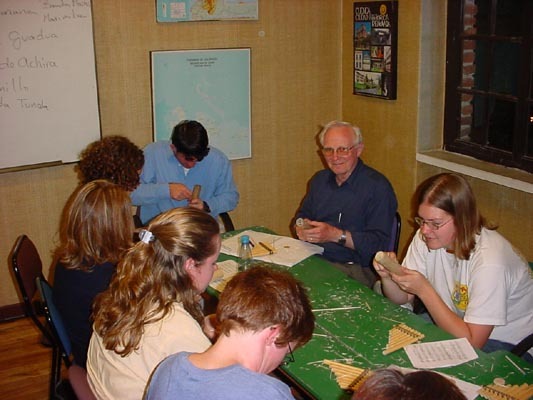 This time I joined Henry Wild’s Adventure Travel Institute’s (ATI) classes that were being given in Truckee, CA, a town in the Lake Tahoe area where we have a second home. I haven’t stopped learning the language since then. 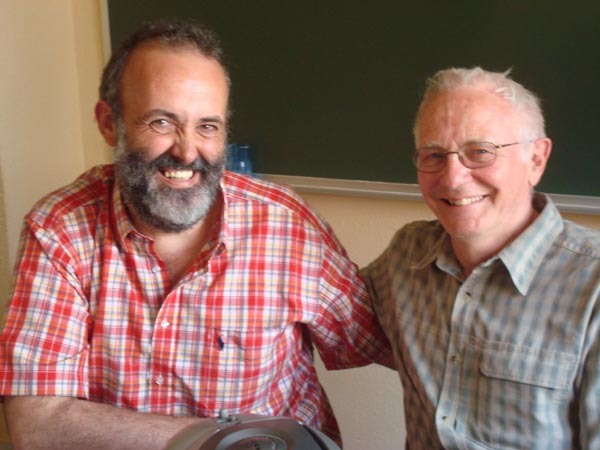 To this end I have attended the Intensive Spanish Summer Institute (ISSI) five times. The school offers a week long emersion course in the month of August in the city of South Lake Tahoe. 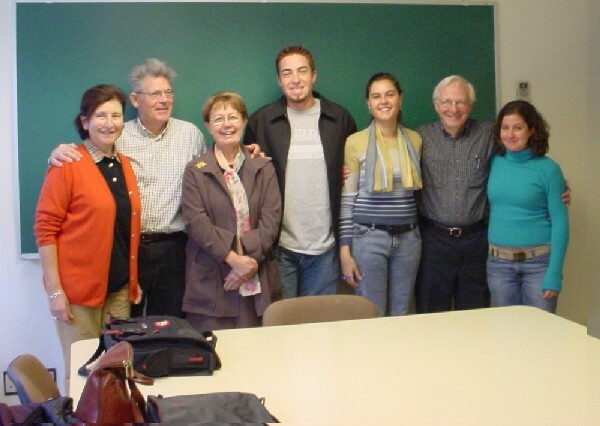 In addition I attended Spanish Language classes in Cuenca, Ecuador (2003); Salamanca, Spain (2003); Santiago, Chile( 2005); Buenas Aires and Bariloche, Argentina (2007); Seville and Granada, Spain (2009); San Miguel, Mexico and Cordoba, Spain (2010). In each case the classes were 2 weeks long and included living with native families while attending school. I took the oportunity each time to tour the respective countries. 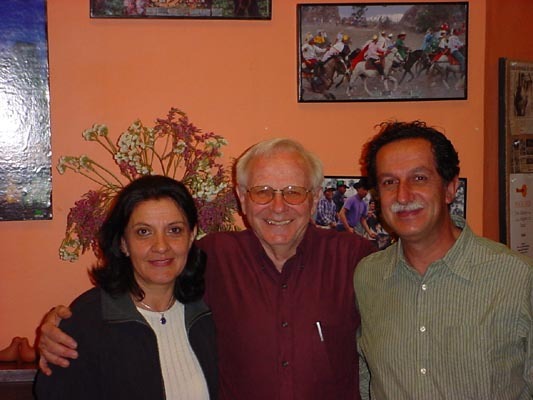 I flew from California to Quito, Ecuador on 16 September 2003 where I was picked up by a school representative and taken to a hotel for the night. The next morning the representative took me back to the airport for a flight to Cuenca which is in the southern part of the country. 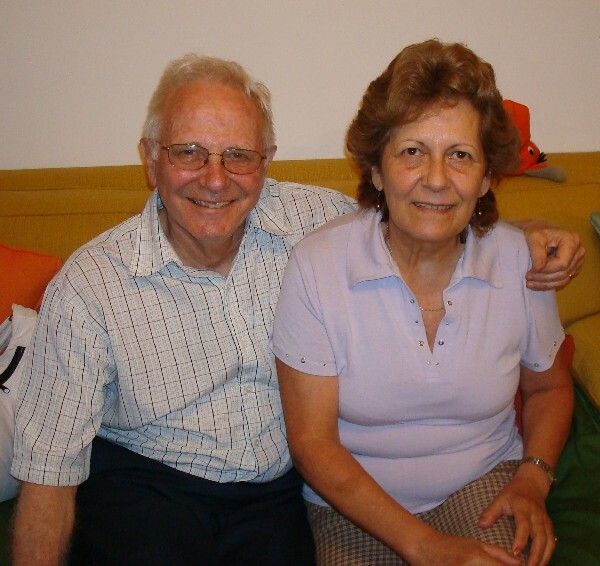 I was met at the airport by the couple with whom I would spend the two weeks, Edgar and Augusta. They took me to their home where I settled into my room. Afterwards Augusta and I walked to the school building for a familiarization tour and a placement test to see which class level I would be in . 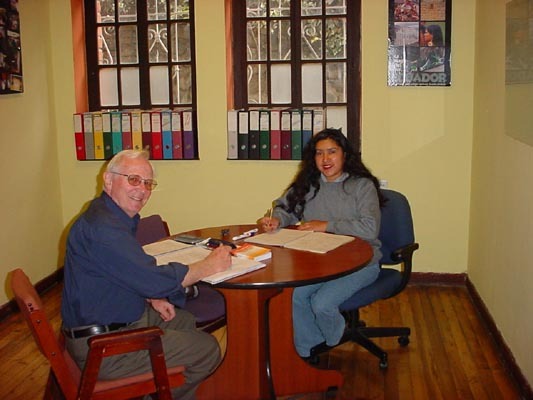 The Cuenca school is part of the Spanish based school system called Estudio Sampere. I was to start classes on the coming monday. the picture with the balcony. It had its own bath room. The school building where I spent my class time. The entrance to the school. The school occupies the upper two floors while the cafe was below. 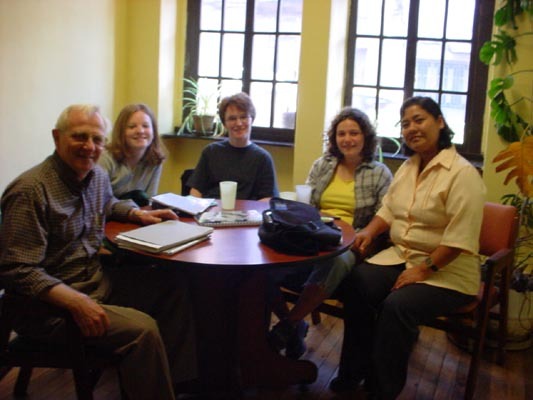 The cafe was a favorite hangout for the students. 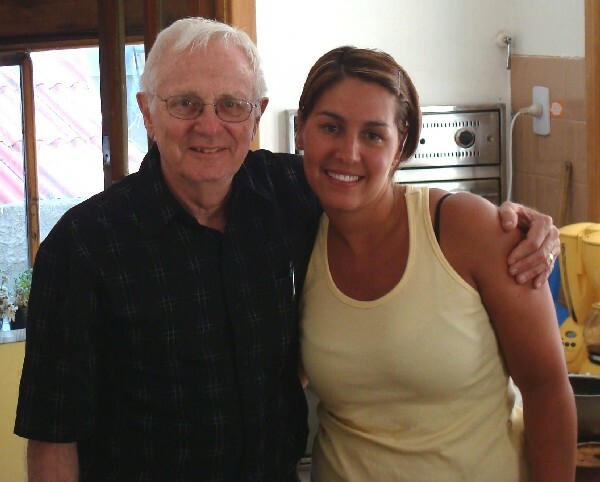 The first night in Cuenca, Augusta and Edgar took me to dinner at Augusta’s mother’s home. 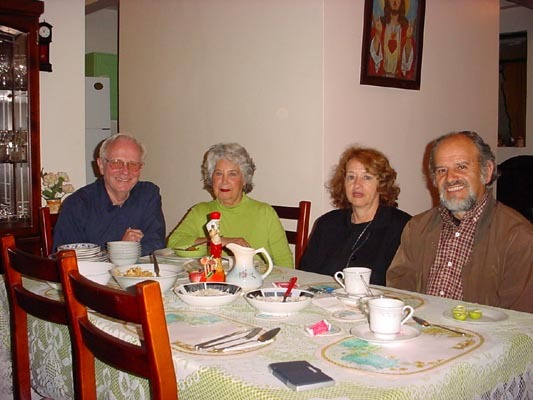 Edgar was a retired Architect and is seated to the right in the picture with Augusta. I was immediately part of their extended family. The school director Juan Martinez and his wife Susana. A group of the teachers at the school. My group class with our teacher Ruth. My private class with Lucia. 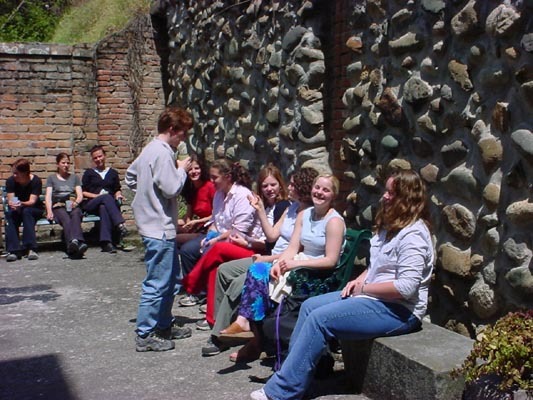 Students having a break in the school courtyard. One of our extra curricular classes. This one was a music workshop to make our own panflutes and guazas (a rattle). 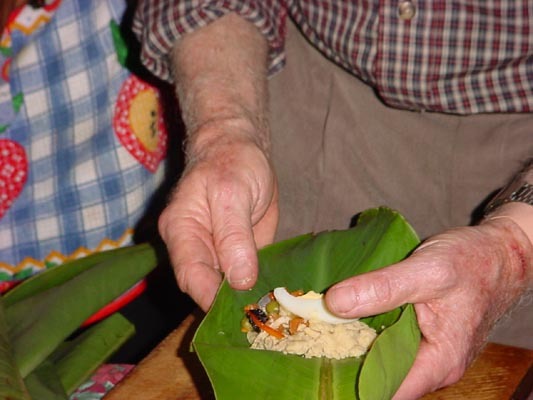 Another of our extra curriculr classes was an evening cooking class. I am preparing Ecuadorian tortillas. When the two week class period was finished, I spent the next two weeks touring central Ecuador and the Galapagas Islands. 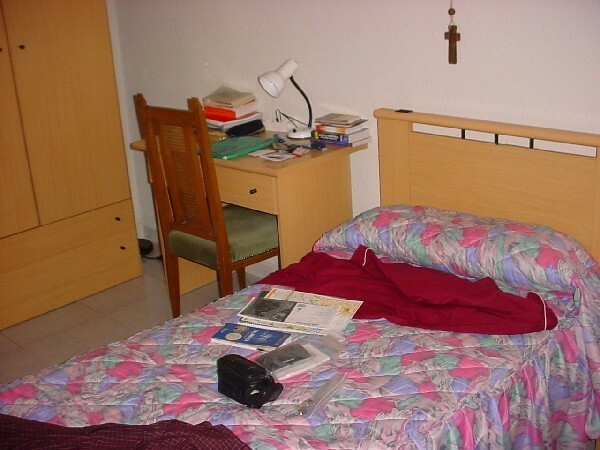 I went to Spain in October 2003 to walk the last 100 miles of the Camino de Santiago and then to spend two weeks in Salamanca attending a spanish language school called Estudio Sampere. 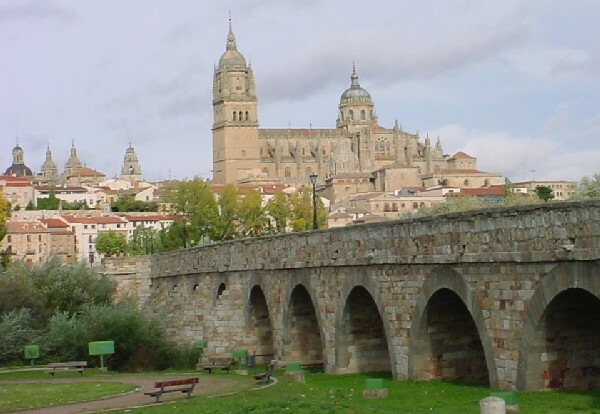 Salamanca is a very academic city and contains the oldest university in Spain. I stayed with a family headed by a house wife, Candelas. 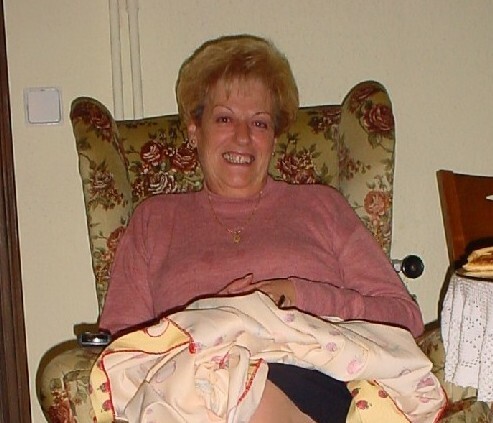 My house mother, Candelas. 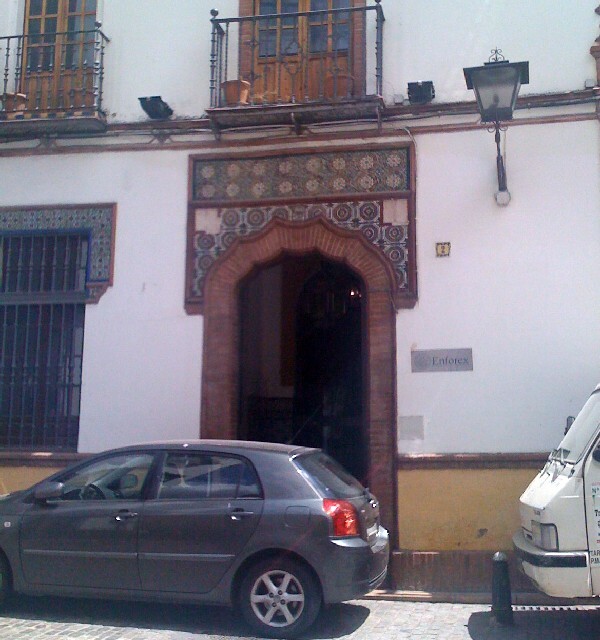 Two other american students, who were attending the University of Salamanca, were also sharing Candelas’s living quarters. I shared a bath with the other students but had my own private bedroom. 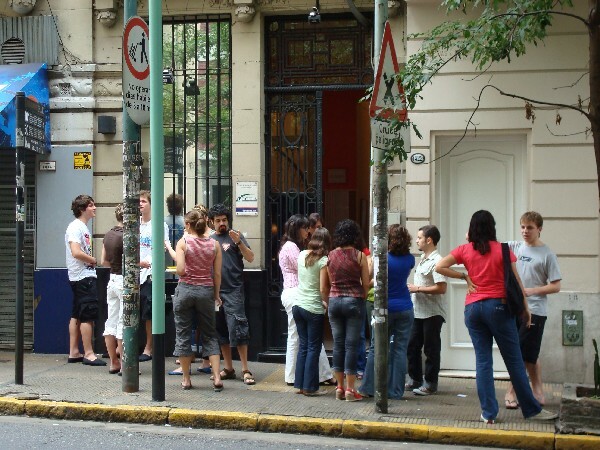 The entrance to the Estudio Sanpere spanish language school. The class rooms were above the ground floor and looked out on the streets. 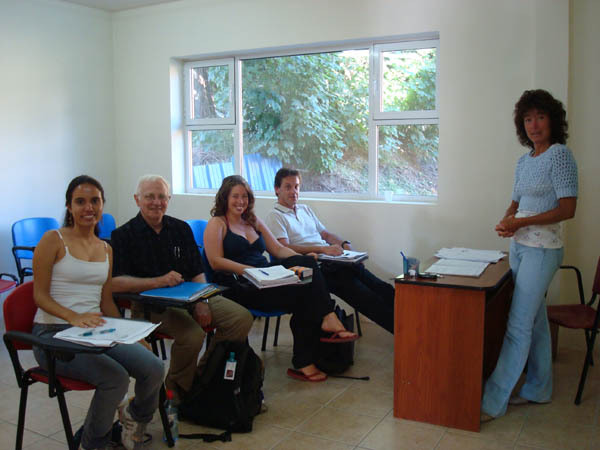 A picture of one of my teachers, Alicia (3rd from the right), and class mates. 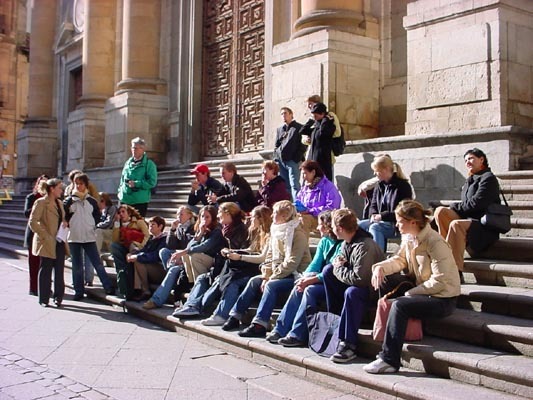 The students on a city tour at the steps of the university library. 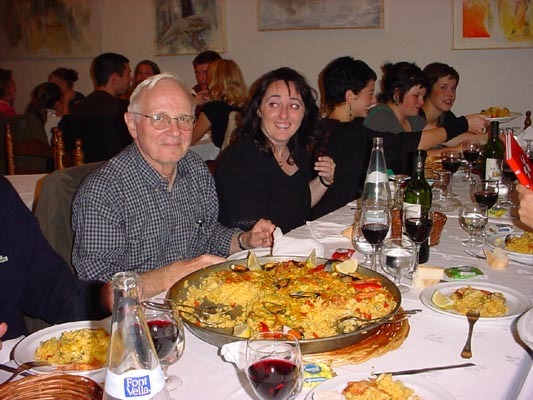 A student paella dinner party. 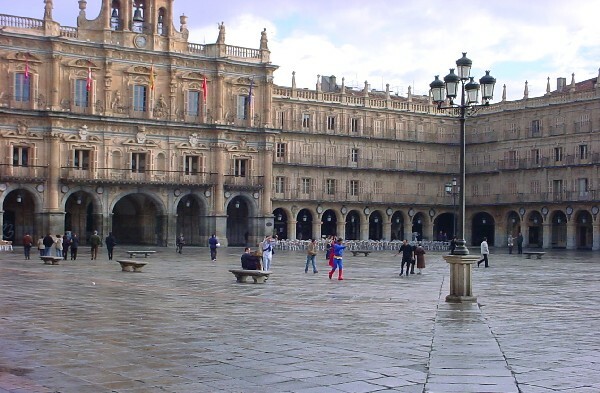 The famous Salamanca Plaza Mayor. The medieval bridge and the city cathedral. 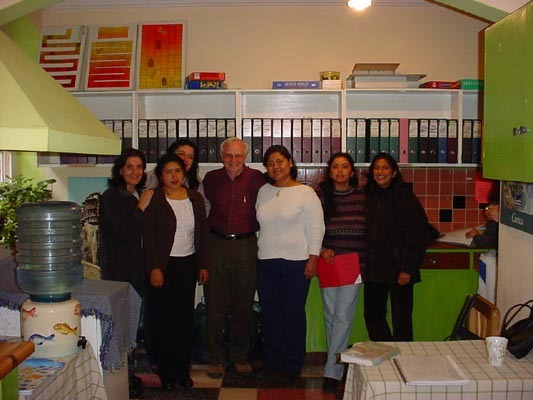 I flew to Santiago, Chile in March 2005 to attend the Spanish language school ECELA for two weeks. I lived with a family that lived within walking distance of the school. 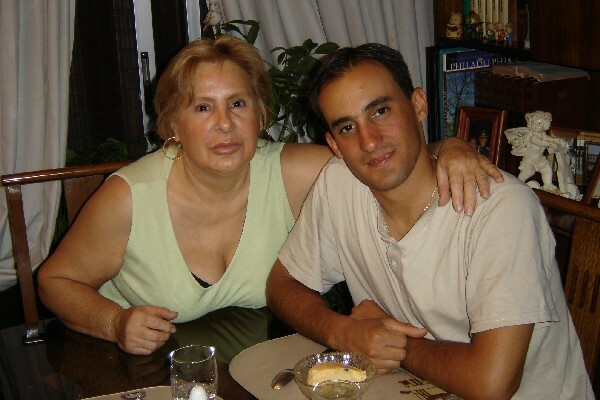 Monica, the house wife where I lived, and her son, Rodriguez. I had a private bedroom and bathroom. 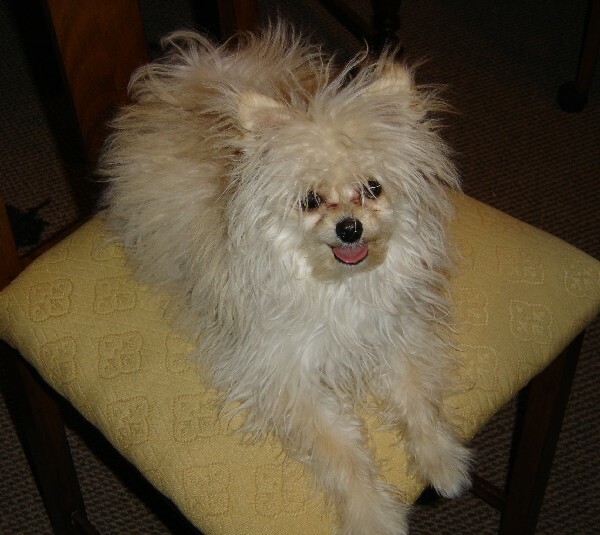 Monica’s dog. Mathias who liked to visit me in my room. The entrance to the school building. My teacher,Veronica (center), and my two class mates. 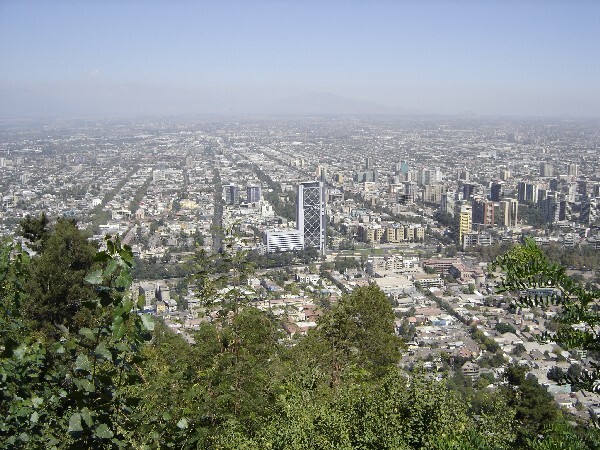 A view of a portion of the city of Santiago as seen from a near by hill top. 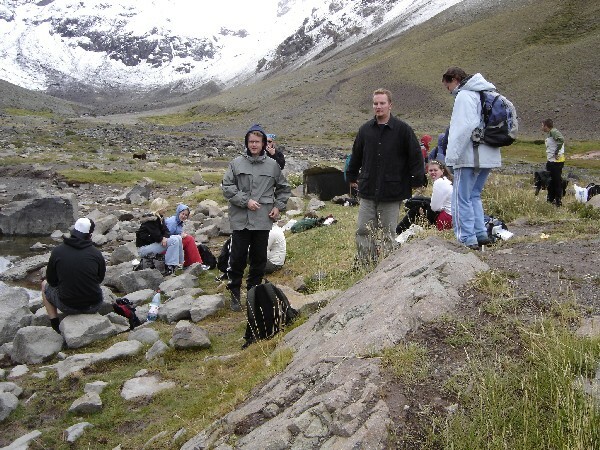 One of our weekend excursions was to the Morado Glacier in a nearby mountain park. 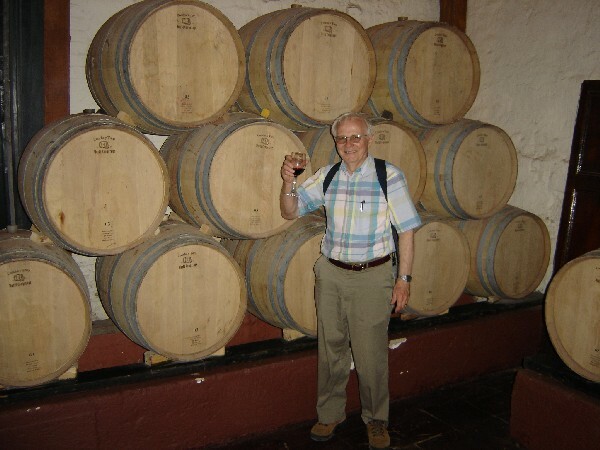 Another of our student excursions was a visit to the Concha y Toro winery. Deep in the cellars of Concha y Toro. My teacher Veronica and me at the school’s going away ceremony. 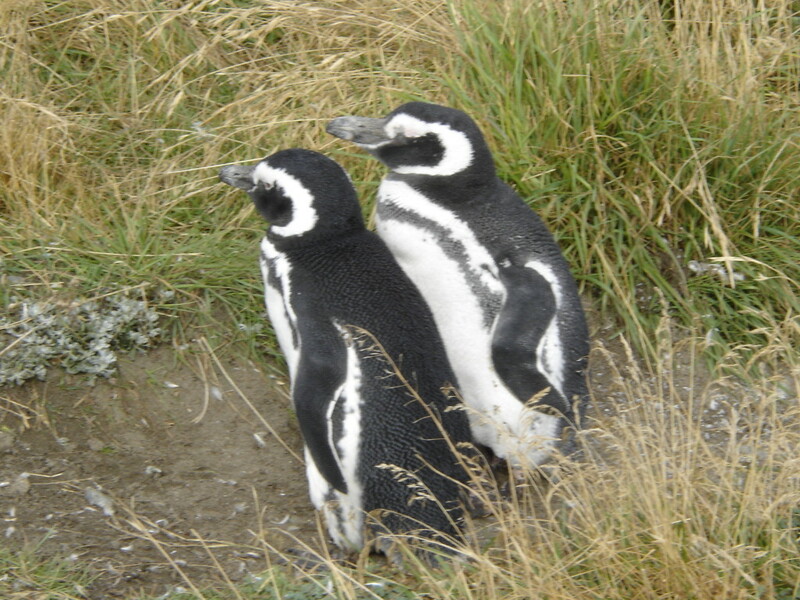 After completing the two weeks of school, I flew to Punta Arenas in Chile’s Patagonia. 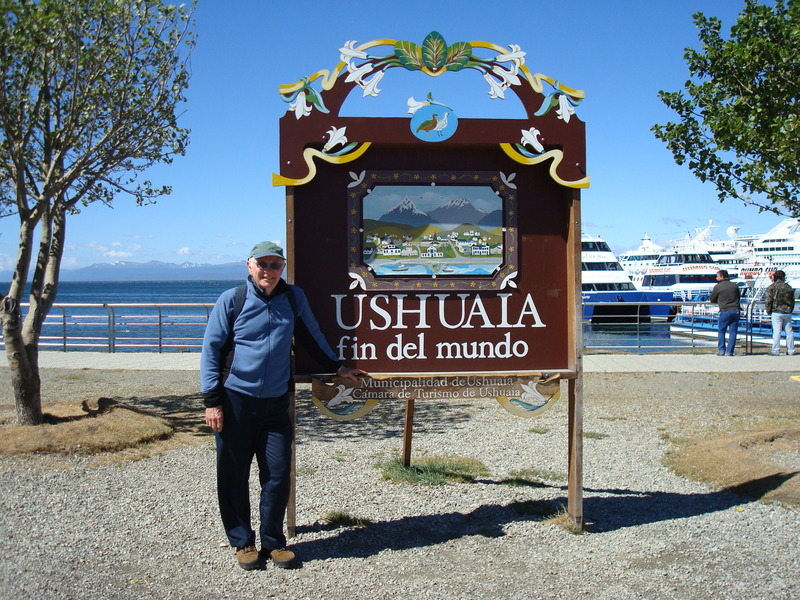 From there I had a chance to visit the Puerto Natales area and the Torres del Paine national park. 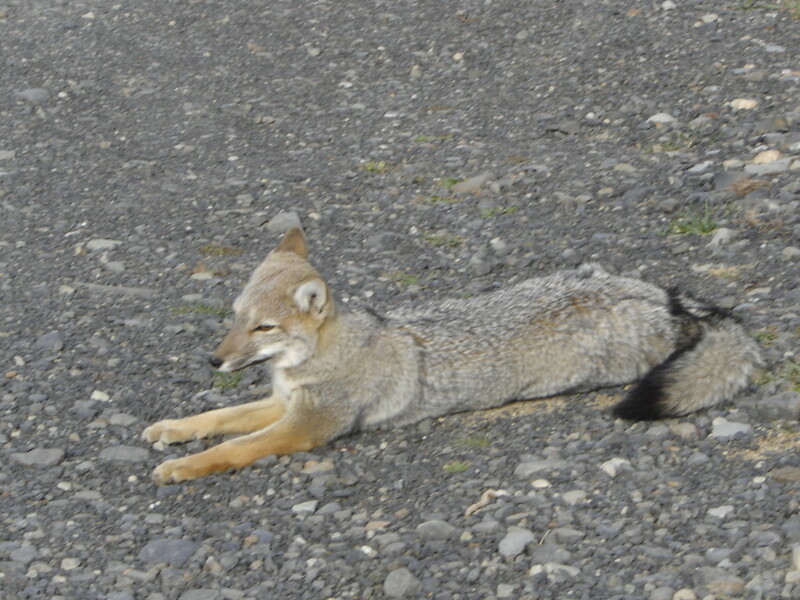 A fox at the Torres del Paine national park. 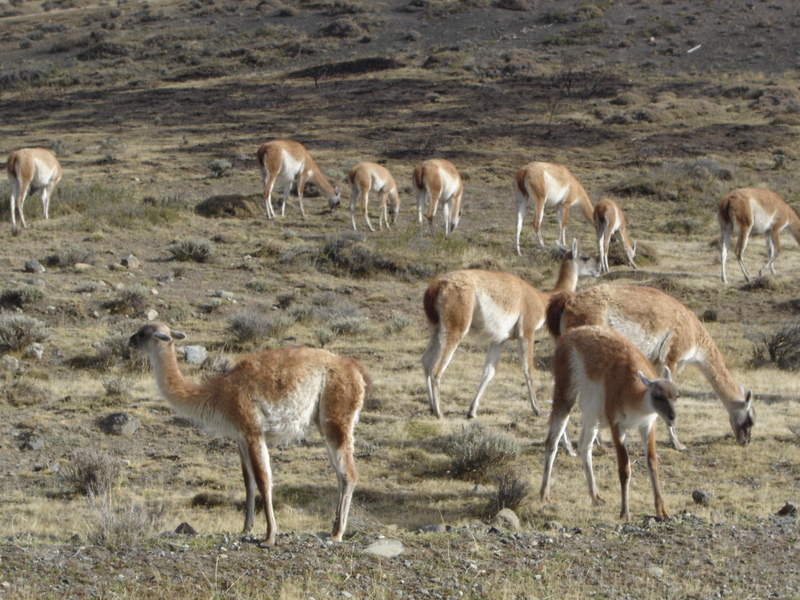 Guanacos, a deer like animal indigenous to this area. 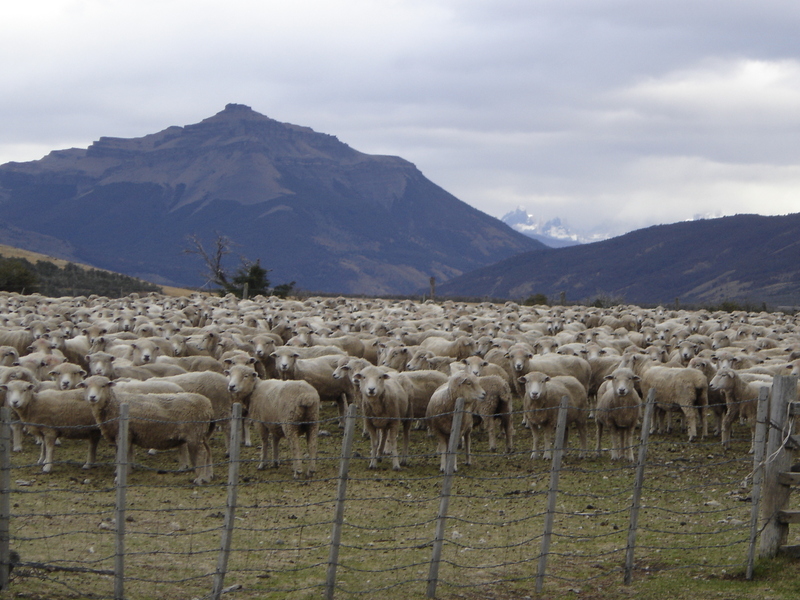 Sheep farming is big business in Patagonia. 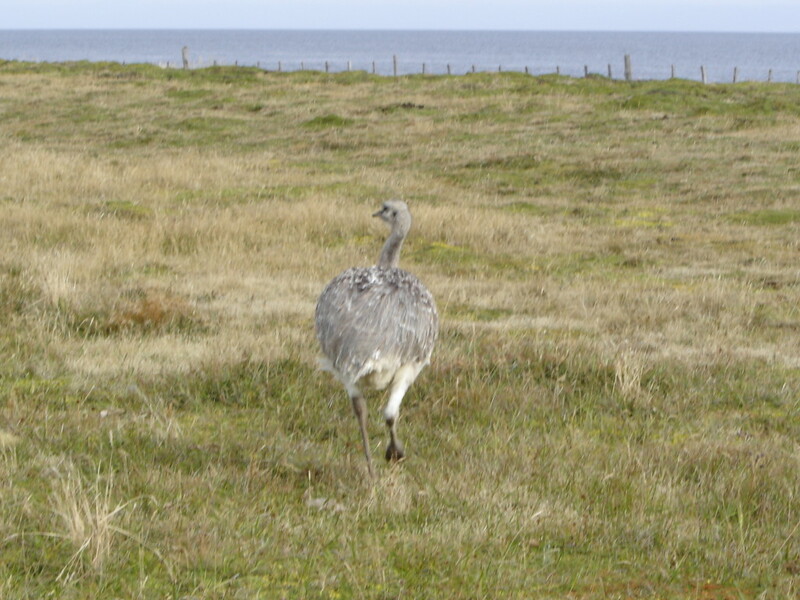 There were ostrich farms in this area. 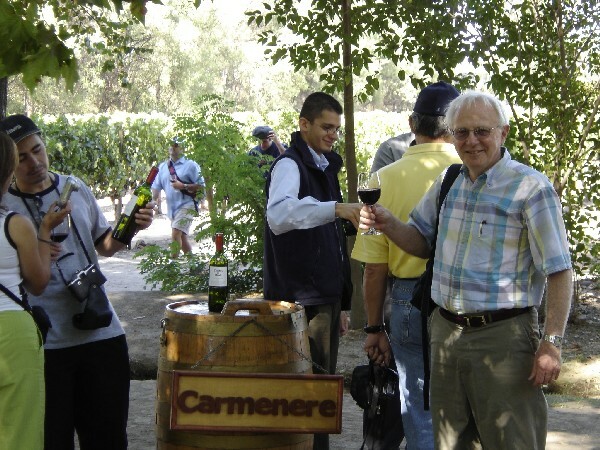 I flew to Buenas Aires, Argentina and arrived on the 17th of January 2008. I arrived on a thursday and school did not start until monday. 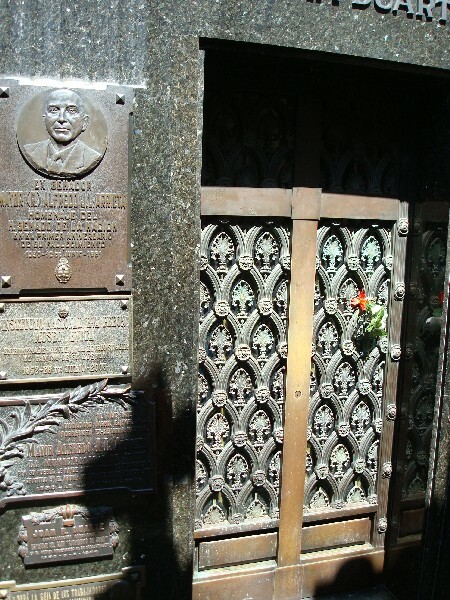 This gave me plenty of time to tour Buenas Aires before school started. 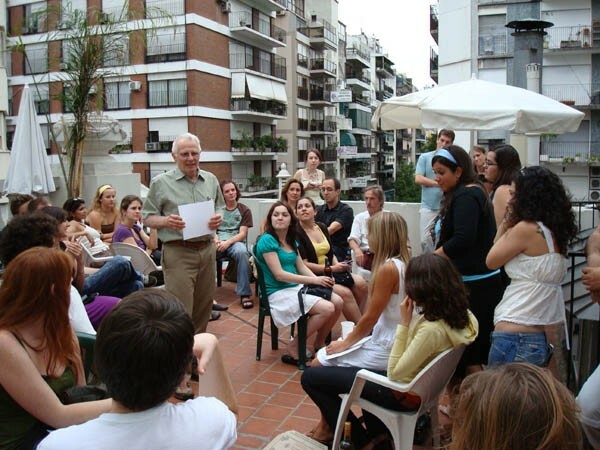 The plan was to attend the Spanish language school ECELA for one week in Buenas Aires and for one week in Bariloche in the southern part of Argentina. 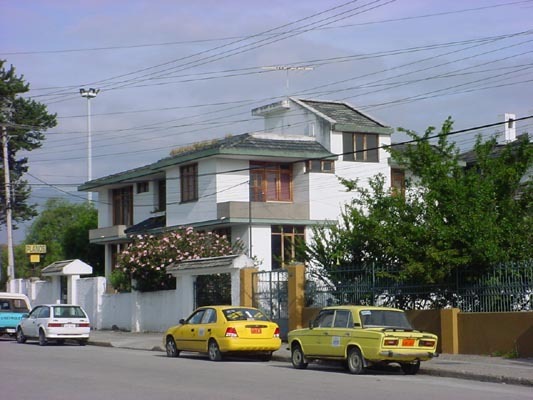 My homestay was with Florinda. Her apartment was about a 20 minute walk from the school. 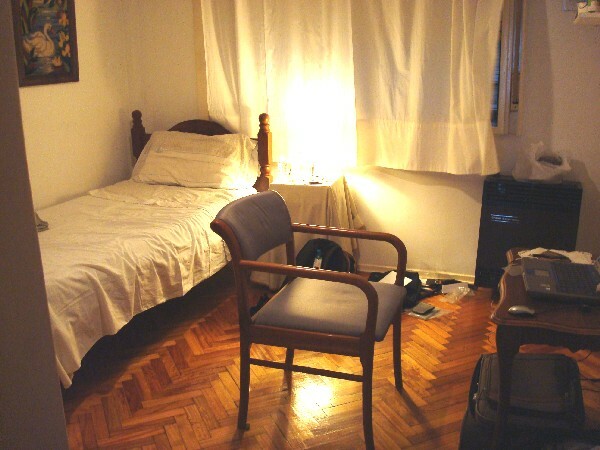 My room in Florinda’s appartment. The entrance to the school building. 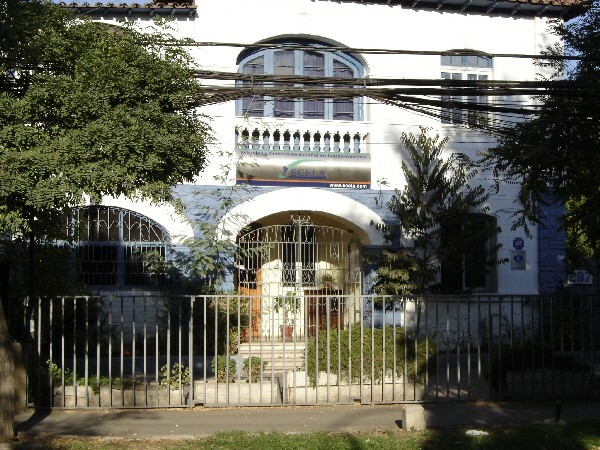 ECELA is the same school system that I attended in Chile. My class. The teacher is the third from the left. 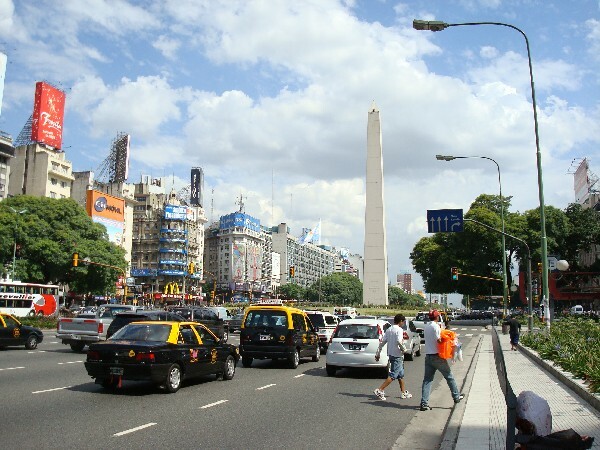 The main boulevard in Buenas Aires. 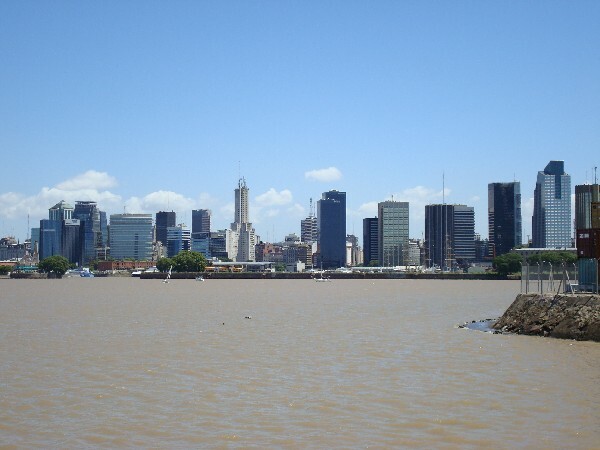 A view of Buenas Aires from an off shore boat excursion. 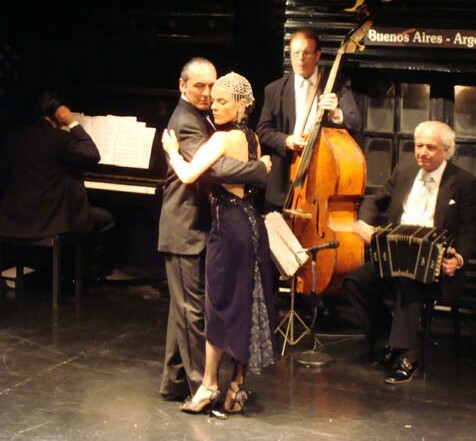 Some tango dancers at a Tango dinner show. Giving my speech in Spanish at the going away party. 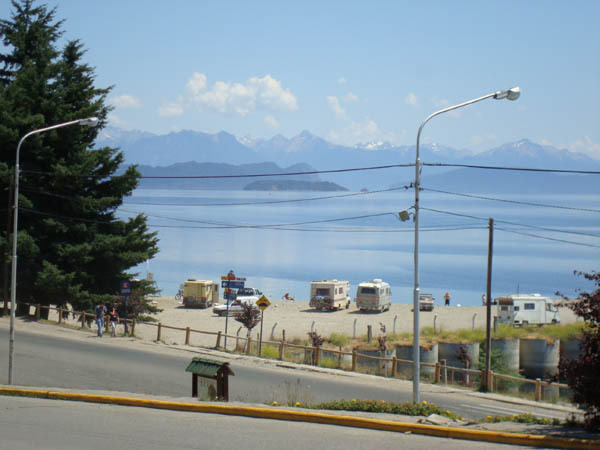 After 9 days in Buenas Aires, I flew to Bariloche which is in the northern portion of Patagonia. 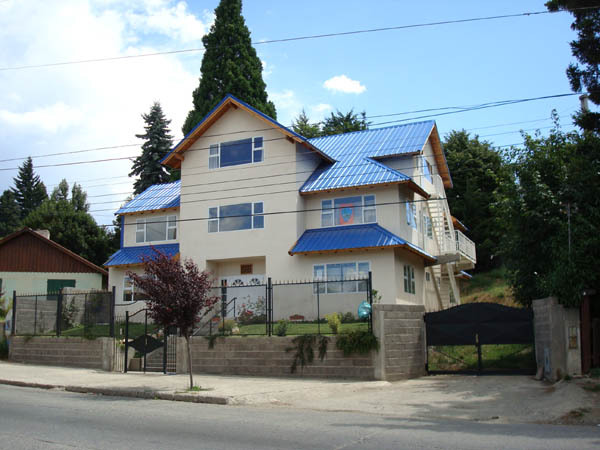 The ECELA school building in Bariloche. My class at ECELA’s Bariloche school. I stayed with Carolina and her family. 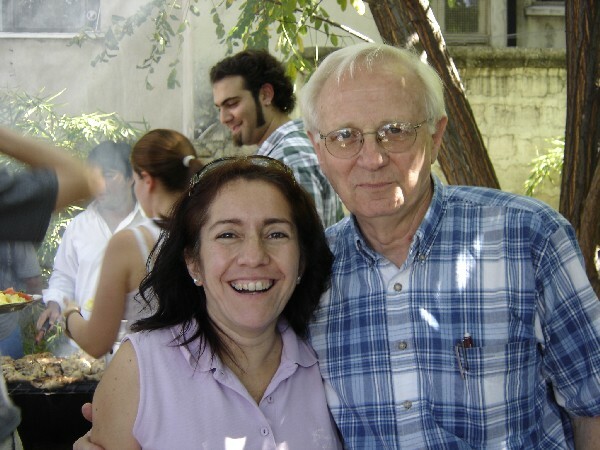 Carolina taught school in the winter while her husband worked in construction. 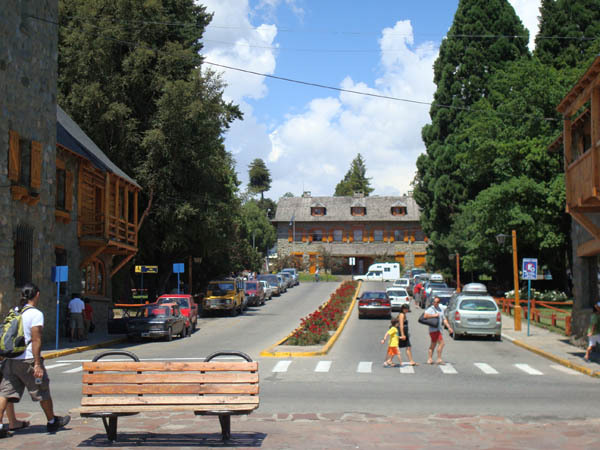 The main street in Bariloche. A view of the Bariliche lake front. 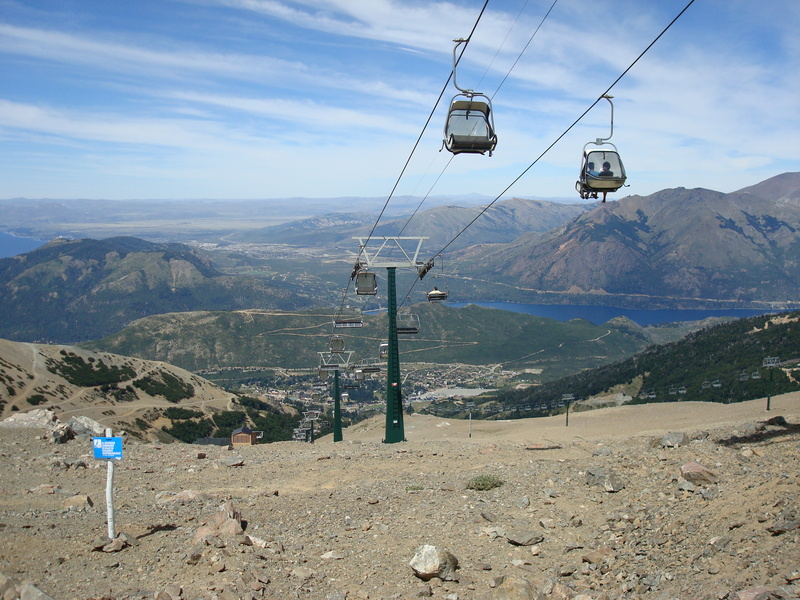 Part of the ski hill outside of Bariloche. 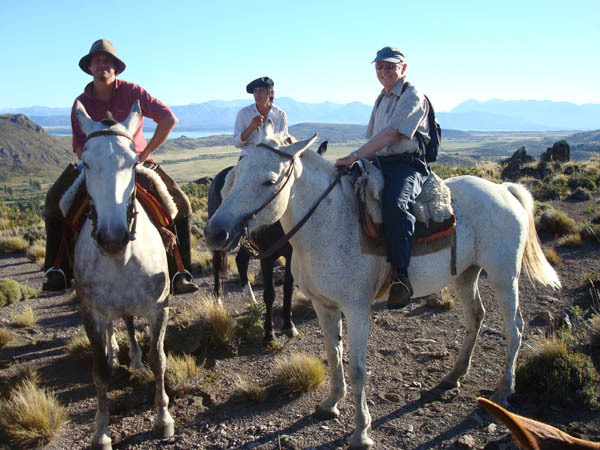 One of the school excursions was to a a ranch where we had a great barbeque meal and tried our hand at being gauchos. 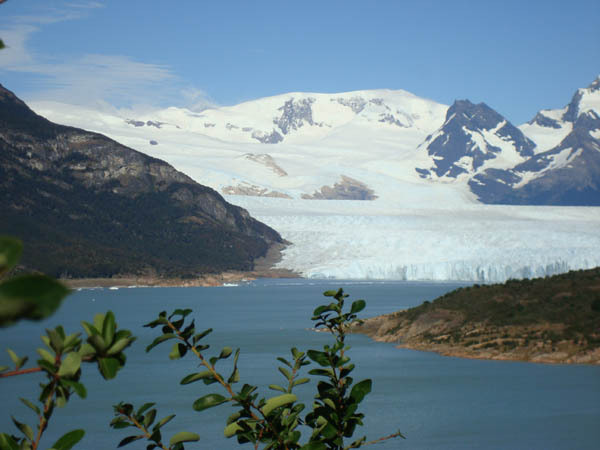 After attending the Bariloche school, I flew to El Calafate and Ushuaia and explored these regions of southern Patagonia. The Moreno glacier outside of El Calafate. At the southern end of the South American continent. 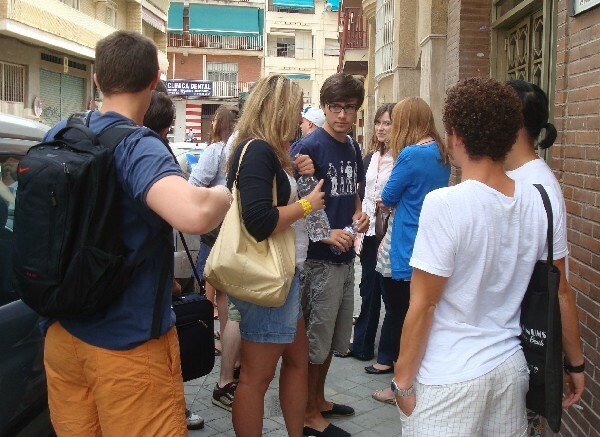 On the 5th of May 2009, I flew to Spain to attend language schools in Seville and Granada. 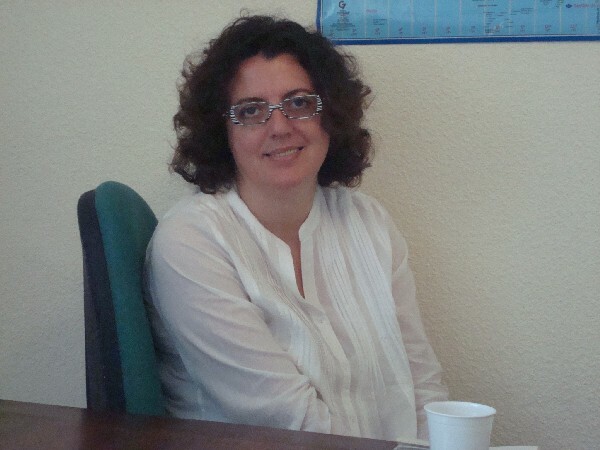 I spent a week in Seville at the Enforex school system which is affiliated with the the Don Quijote school system. 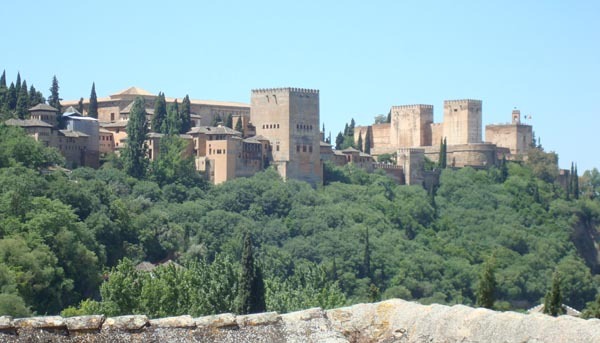 After a week of school in Seville, I took a train to Granada to attend a week of school at Don Quijote. 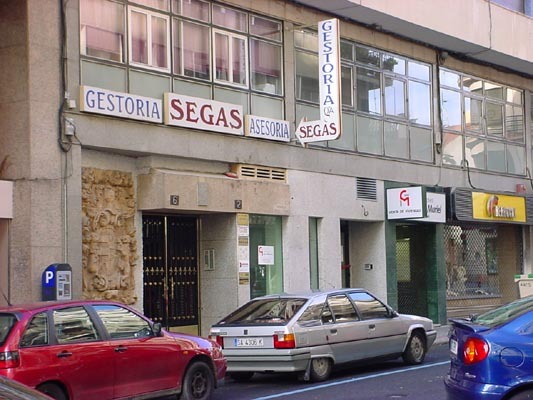 The time prior to and after attending the schools, I toured various parts of Spain by rental car. 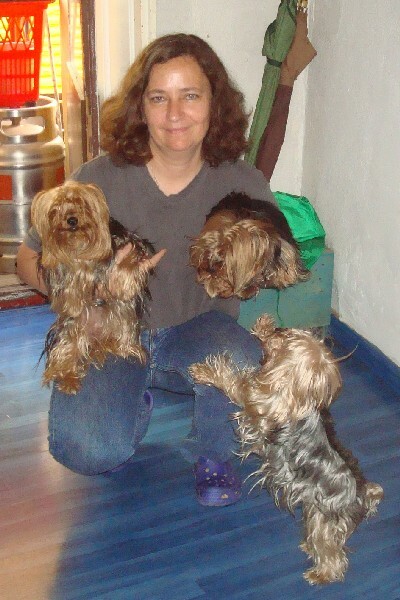 My home stay was with Mercedes and her family of dogs. 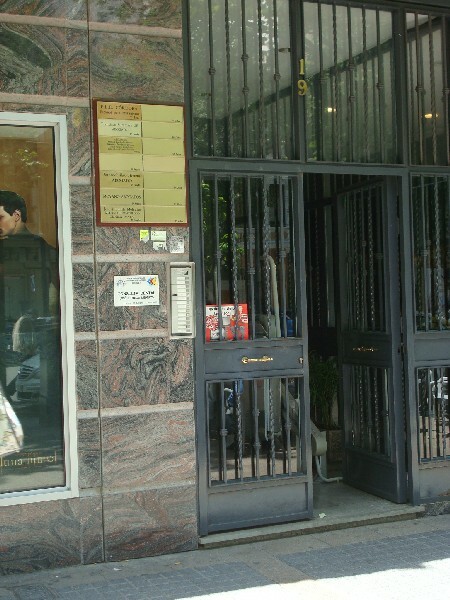 The entrance to the Enforex school. My class with Inma who is seated in the center. My class with Cielo who is standing 4th from the right. 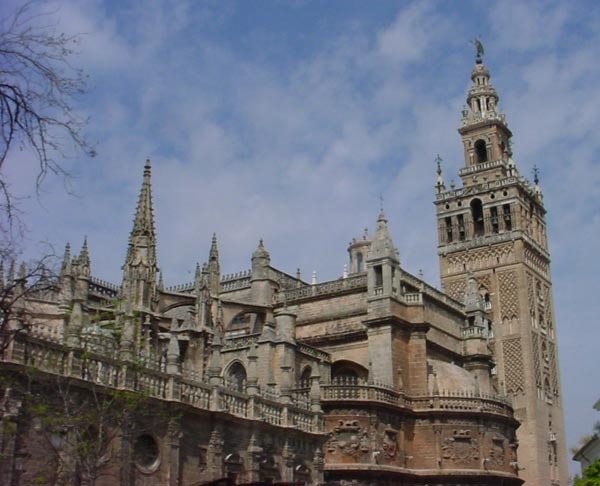 A view of the famed Seville cathedral. 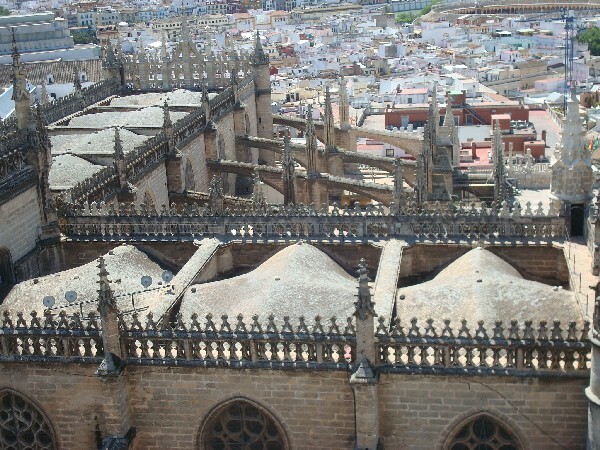 A view of the outer part of the cathedral´s nave taken from the cathedral tower. 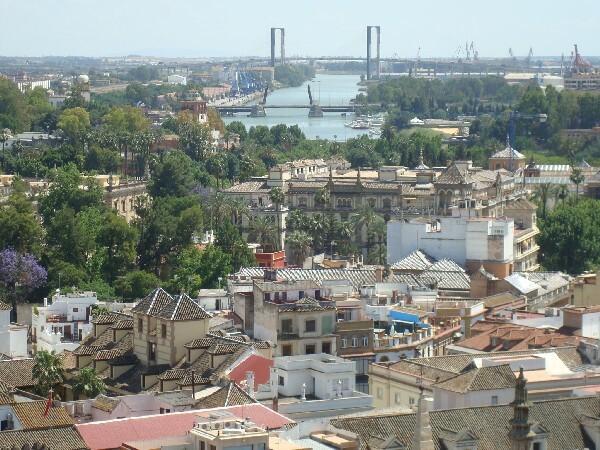 A view of a portion of Seville taken from the cathedral´s tower. 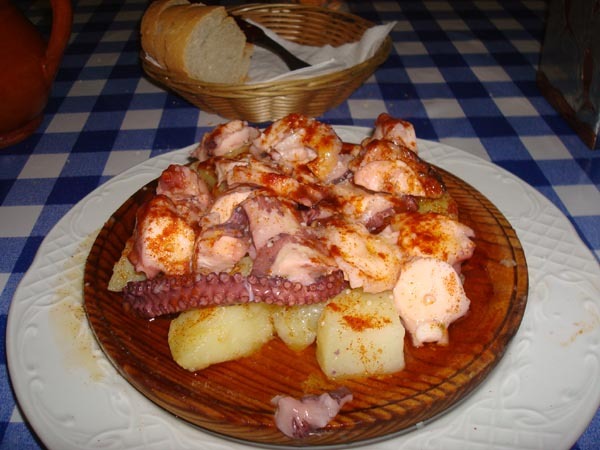 My favorite Spanish meal, Pulpo Gallego (octopus in the Galician style). 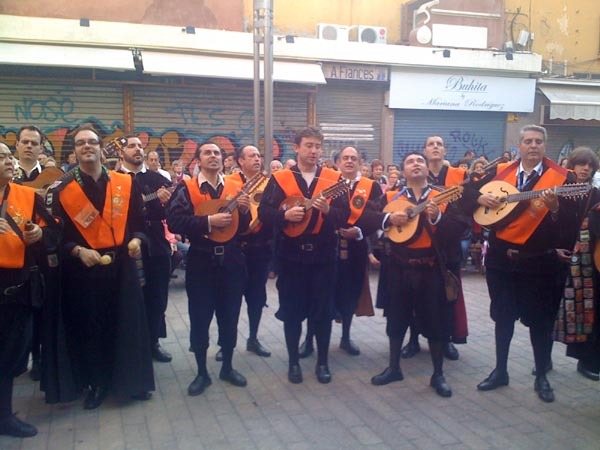 A wandering student minstrel group ¨Tuna¨ serenading young ladies. 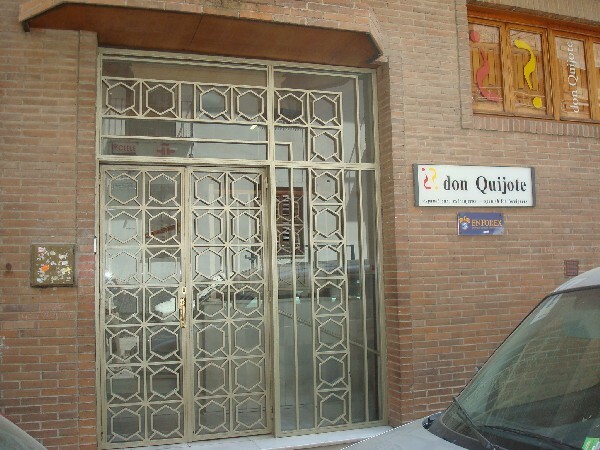 The entrance to the Don Quijote school in Granada. 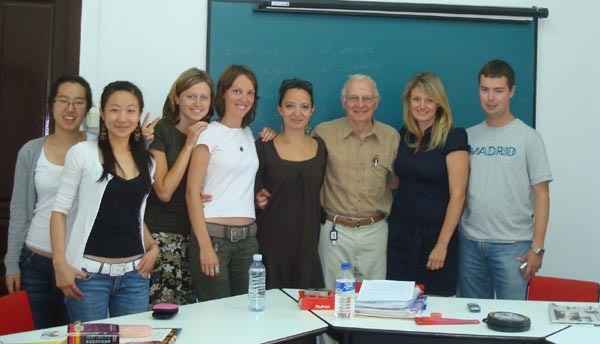 One of my classes at Don Quijote, Granada. The teacher, Inma, is at the far end of the table. My other teacher was Ramon. Some of the students at break time. I get an A for effort in the evening Flamenco class. 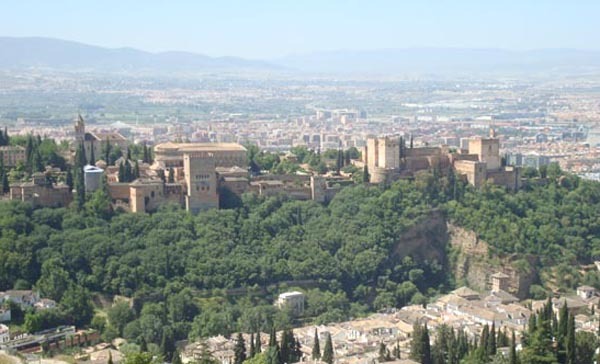 A view of the Granada from the nearby hills. 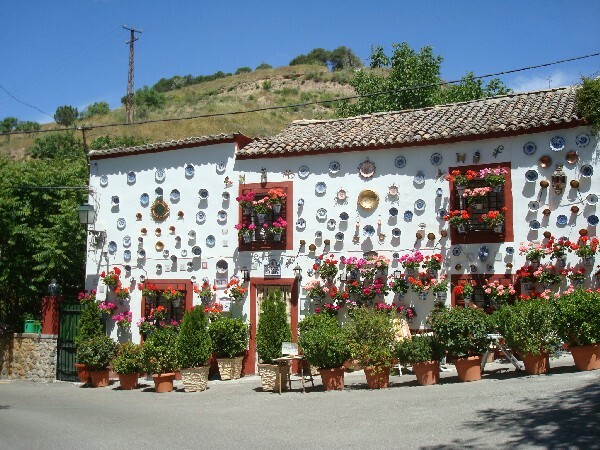 A well decorated house in the hills above Granada. 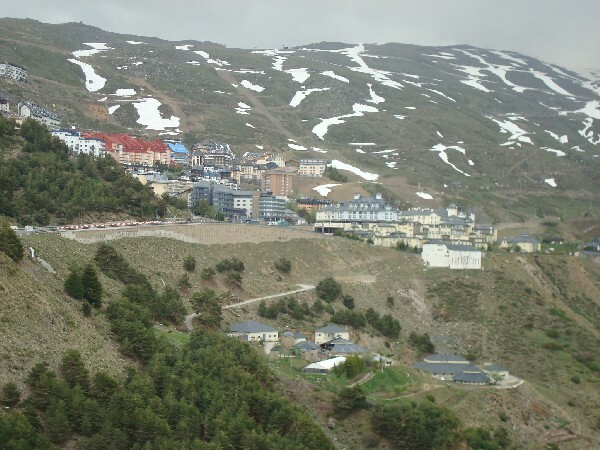 The ski resort in the Sierra Mountains above Granada. 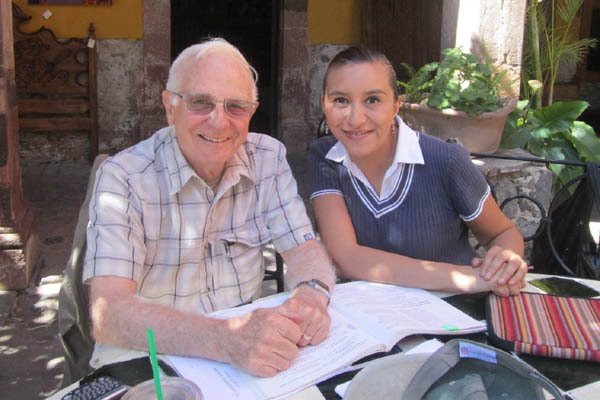 My wife’s sister Annabel and her husband Don rented a home in San Miguel de Allende in the state of Guanajato for the month’s of January and February, 2010. Donna and I visited them for 16 days. 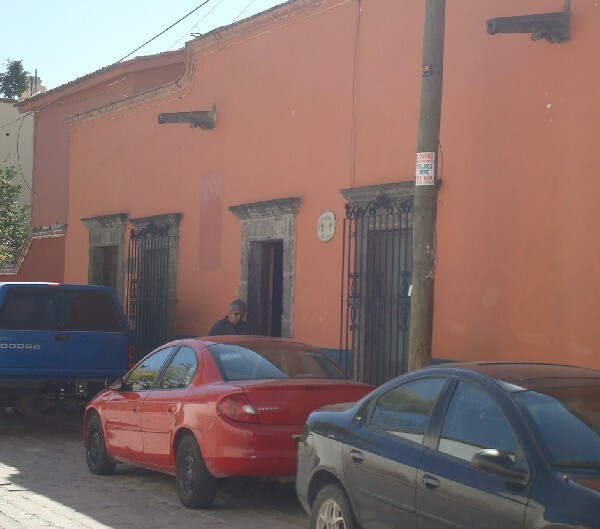 While there I attended a Spanish language school called Centro Mexicano de Lengua y Cultura. I had a week and a half of private lessons. The school was only about 4 blocks from the house that we were staying in. On subsequent visits in January 2012 and 2013, I took another 8 and 12 hours, respectively, of private lessons from Adriana. 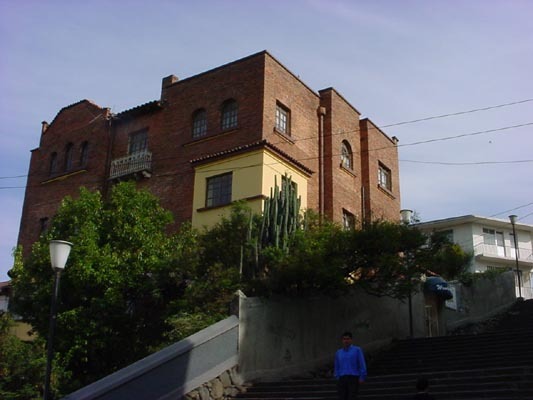 The entrance to the school Centro Mexicano de Lengua y Cultura. Adriana was my grammar teacher. 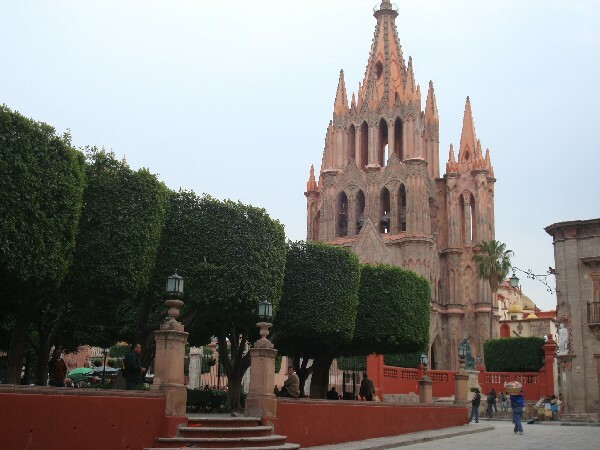 A view of the plaza with the Parrochia in the background. 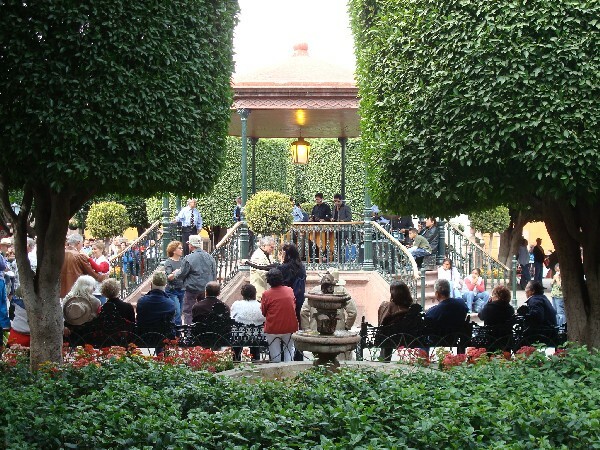 Another view of the plaza which is a busy meeting place for both natives and visitors. 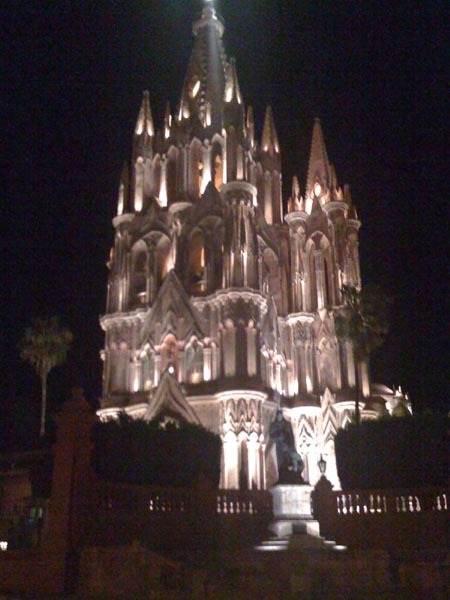 A night time view of the Parrochia. 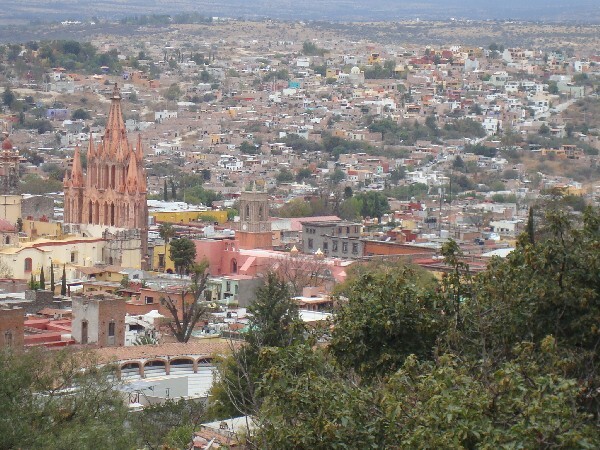 A view of San Miguel from a nearby hilltop. 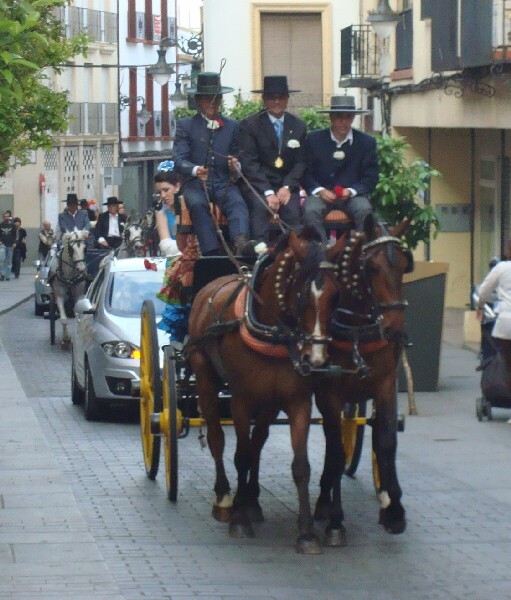 I flew to Madrid on the 13th of April 2010 and did some touring by rental car in the La Mancha area of Spain before settling into a hotel in the city of Cordoba. I enrolled in the spanish language school E.L.E. 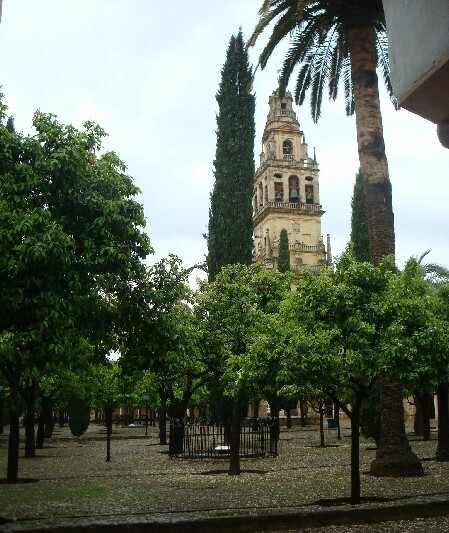 Cordoba for a week of private lessons. 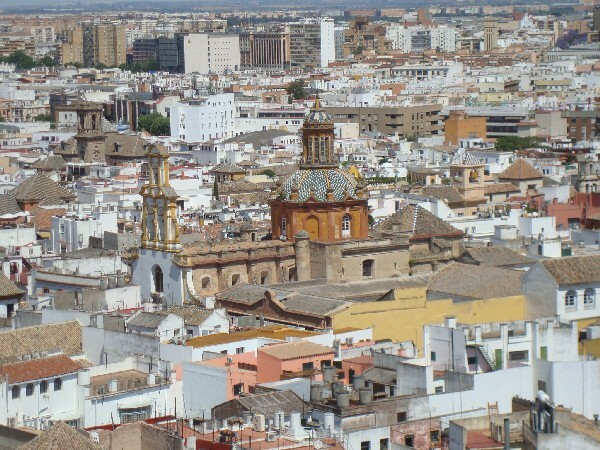 The main reason for choosing Cordoba for this trip was due to my interest in the music and culture of the “Tres Culturas” (Moorish, Christian, Jewish) stemming from medieval times. 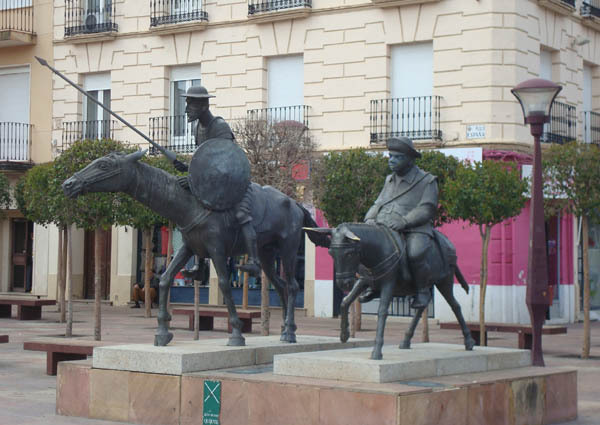 Statues of Don Quijote and Sancho Panza. Most towns in the La Mancha area of Spain feature symbols of Cervante’s characters. 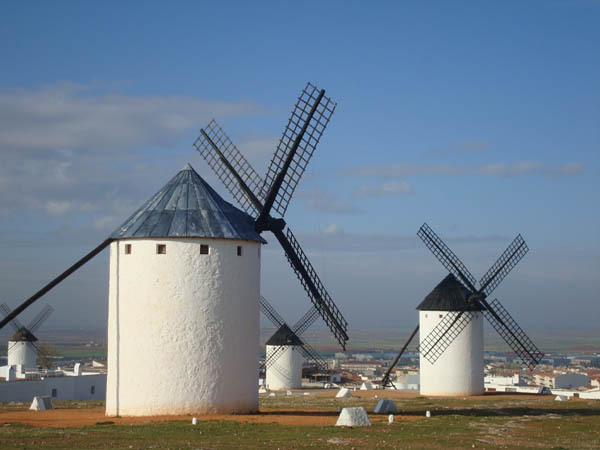 Modern day versions of Cervante’s famed windmills which can be seen in the La Mancha area of Spain. 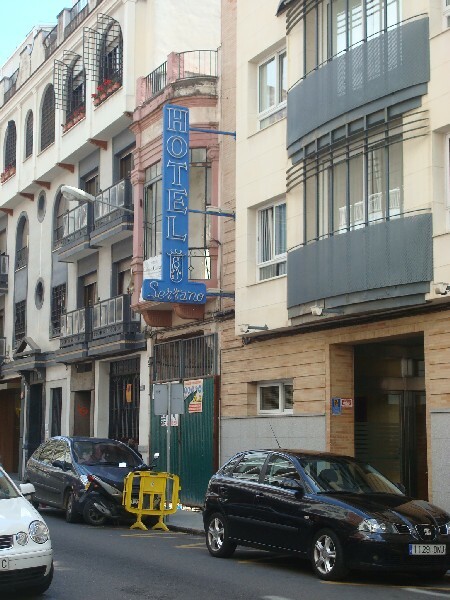 The Hotel Serrano In Cordoba where I spent 8 nights. It was located about 3 blocks from the school. The entrance to the school which was located on an upper floor. 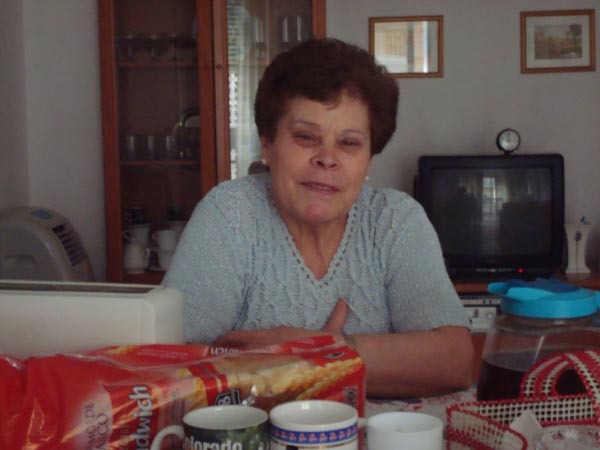 Hipolita, my Spanish language teacher from whom I took private lessons while in Cordoba. The Mesquita garden. 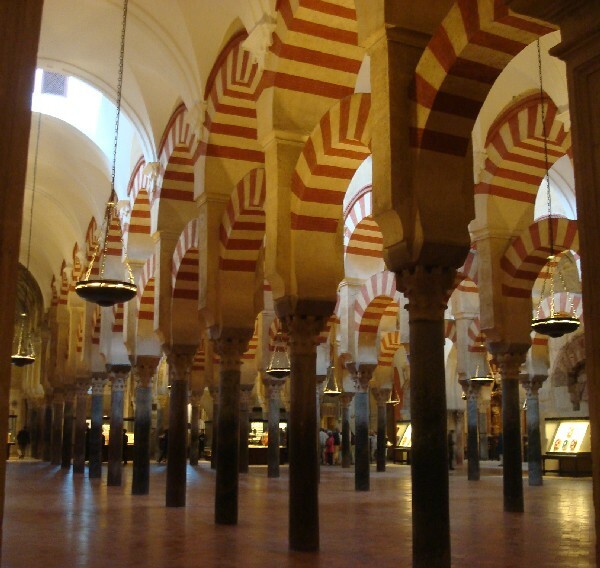 The Mesquita is a former Moorish mosque converted into a Catholic cathedral. Some of the interior of the Mesquita which still contains much of the early mosque trappings. 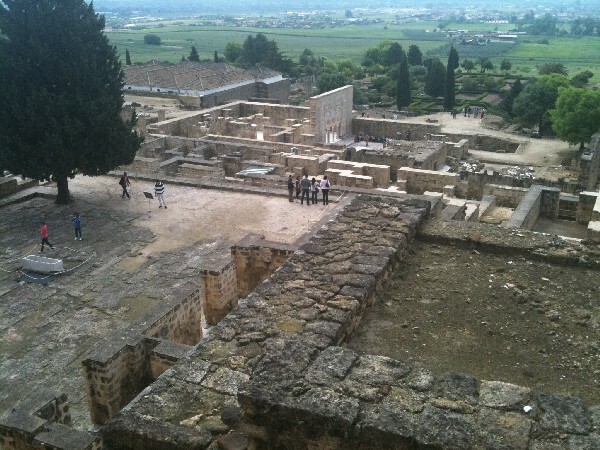 A view of the ruins of Madinat al-Zahra, a 10th century city outside of Cordoba which was built by Abd al-Rahman III during the Caliphal splendour. One of the horse drawn wagons in a colorful wedding procession. The week that I was in Cordoba, I was fortunate enough to be able to attend a week long series of music recitals entitled XIV Ciclo Musica, De Las Tres Culturas. 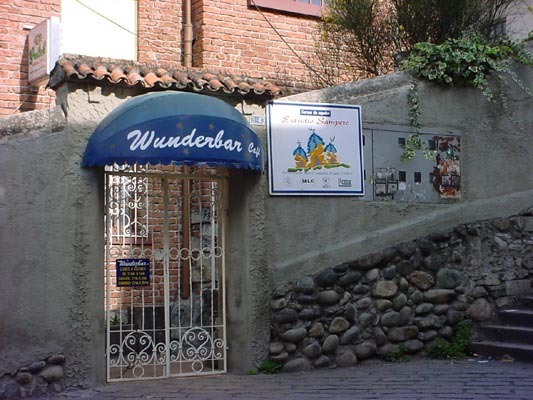 This kind of music was the very reason I chose to come to Cordoba. 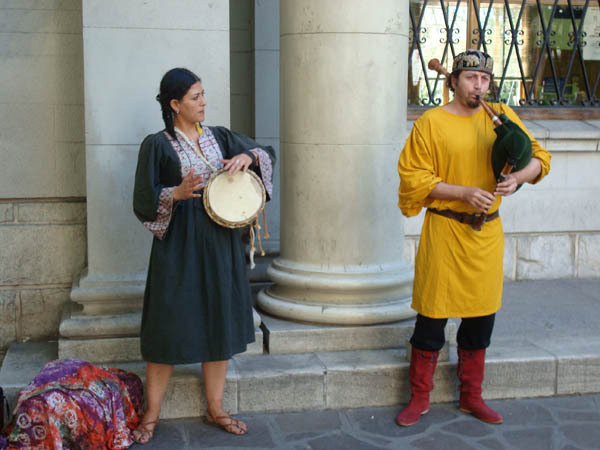 The music consisted of medieval sephardic, christian, and Arabic music. 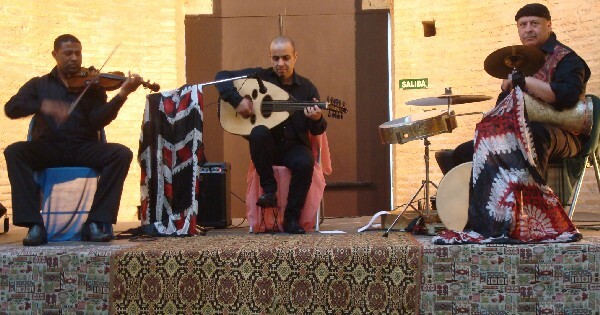 The group Aquitania presented music entitled “La Memoria de Sefarad”. 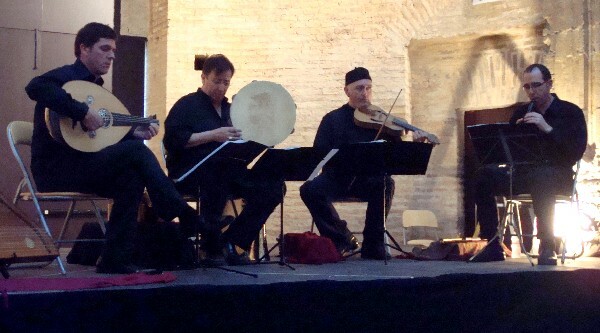 The group Quarteto de Uruena presented music entitled “La Musica de Las Tres Culturas”. 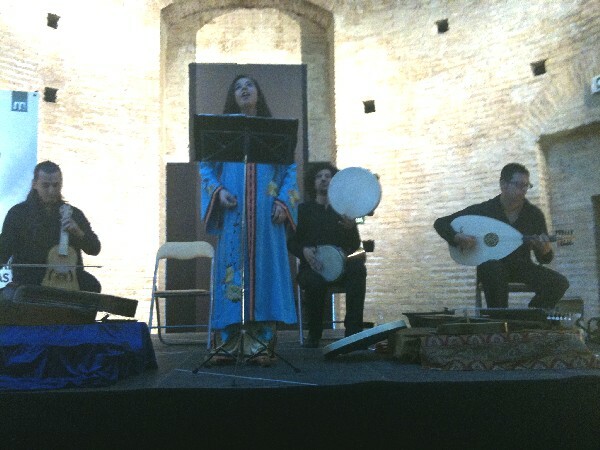 The group Beth Nahrin presented music entitled “Musicas del Magreb y Oriente Medio”. The three players came from Morocco, Syria, and Iraq. There were other music recitals that I attended. After leaving Cordoba, I toured the Alicante area by rental car before returning to Madrid for my flight home.